Today we wrapped the first season of RADAR! Our final shoot was with Color Me Katie. 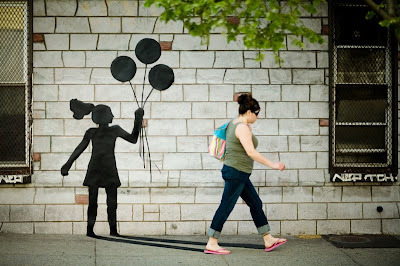 Katie Sokoler is a street artist who believes that random acts of kindness can be infectious. She’s seen it first hand. After launching her blog last October she’s gained a global following, many of whom have been so inspired by her work that they’ve created their own. 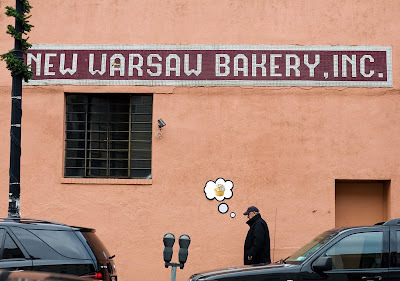 Our final shoot day was spent placing shadows and thought bubbles throughout Brooklyn. Favs of the day a Mexican Popeye in front of a laundromat and a poodle named “movie star” thinking about cats. The day also marked a milestone for WBP – what started as an experiment almost 2 and half years ago has been growing by leaps and bounds over the last six months. RADAR marks a step in a new direction. One of which provides direct creative opportunities to the community that WBP servers. Finishing out the season with Katie was a great way to top things off.